Square rigged ships, the key element in overseas trade for so many centuries, were very poor performers to windward. All too often, this caused their loss. Tall ships built and rigged in the present day perpetuate this serious defect. The difficulty all along is a simple one: the yards can´t swing around enough to lay a close-hauled course because the standing rigging is in the way. This was always an acknowledged problem. Between 1825 and 1845 the British Admiralty conducted sea trials aimed at improving the pointing ability of smaller warships for tactical purposes. Nothing came of these experiments because Steam was about to appear onstage, and builders of commercial sailing ships went on rigging them just as they always had done. Today´s windjammers have auxiliary engines, but that doesn´t solve the problem, it merely conceals it. And yet truly weatherly square riggers have existed, and it is possible to replicate their features today without departing from traditional materials or manual handling procedures. The author has been working on this matter since 1982 and to date the result is one 36-metre, 226 Gross Tons sail training vessel, PELICAN OF LONDON which can make good better than 40º to the real wind in the right conditions. PELICAN´s rig is indirectly derived from the mid-XVIII Century three masted Xebec (Chebec), a lean, graceful vessel of Arab origin with three masts each setting a tall Lateen sail. This rig´s ability to point high into the wind made Xebecs quite deadly in their purpose, which was piracy. To hunt pirates the Christian Mediterranean nations copied these ships for their own navies, shipwrights in the Balearic Islands becoming acknowledged as the best specialists. But three huge Lateen sails took a lot of handling, so when changing social conditions in Europe made skilled seamen scarcer, these ships adopted square rig on the mainmast, with very little detriment to windward ability since the yards could be braced very sharp. This was the Xebec-Polacre rig. 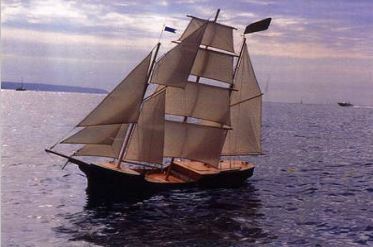 EARLY XEBEC-POLACRE RIGGED MODEL: In 1986 a 2.25m working model was built with the updated version of this rig. Sailed extensively in the Bay of Palma de Mallorca, this little ship could brace her yards to within 18º of centreline as opposed to the 37º standard in clippers. She pointed extremely high and this eventually came to the attention of Commander Graham Neilson, RN, Ret ´d., creator of the Brig ASTRID. 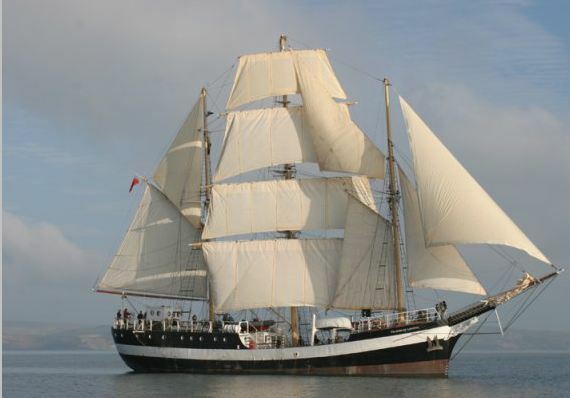 who had just purchased the 36 metre steel hull which was to become the sail training vessel PELICAN OF LONDON. Commander Neilson had been contemplating another Brig but was seduced by the idea of weatherliness. THE PELICAN MODEL. 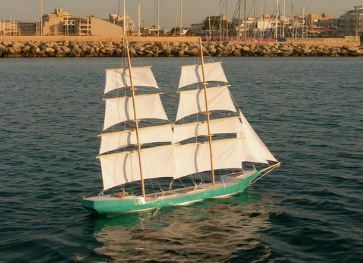 Another scale model was made incorporating the Xebec-Polacre three masted rig, but shaped and ballasted exactly to PELICAN´s hull lines (she weighed 193 Kgs, 425 lbs). 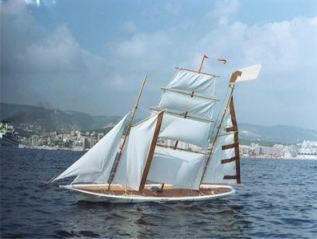 This was test sailed in Palma Bay in 1998 and exhibited all the previous model´s windward ability. This, the full-sized parent ship was to reproduce on her sea trials in 2007, confirming the validity of trials with large scale sailing models. In this three-masted rig the inherent problems with traditional square rig´s standing rigging have been solved by a) leading the backstays much further aft, and b) by taking the upper stays for the mainmast to strong points on the foremast. At the same time a new wire necessarily made its appearance, the Neilson Stay. This item results from taking the main forestay to the mast at a point just below the lower yard instead of above this, so that the yard free to swing unfettered through a wide arc instead of coming up against the stay. In a paper read before the 14th Chesapeake Bay Symposium the author proposed that this wire should be named after the first experienced square rigger master having the courage to adopt it, hence the name. In due course the entire rig was validated by the Lloyd´s Register Rig Verification computer Program with no significant amendments, nor have any problems surfaced since then in several thousand sea miles. THE WEATHERLY BRIG: At that stage however, it seemed that there was no way to apply all this to a Brig, because a Brig has no mast forward of her foremast to which its upper stays can handily be led, as was the case in the Polacre. The puzzle was to be finally solved in 2006, with the aid of a second “new” wire, the Sky Link Assembly. A machine was made to study the effect of increasing traditional mast spacing in a Brig designed to go to windward. This apparatus ran on roller bearing rails next to the sea, and at a flick of the wrist the deck could be extended to increase mast spacing from the conventional 40% Length on Deck to 50%L, sailing thrust being measured by an in-line kitchen dial scale. On a course of 45% to the wind (true = apparent here), although the mainmast squares seemed to have been filling quite adequately with the masts “close up”, the result of snapping the deck “open” was an astonishing 84% boost in thrust. Meaning that the mainmast sails had hardly been contributing any propulsive force until then, due to turbulence from the foremast sails. What is the Sky Link Assembly? Its basis is a stay from the fore masthead to the stemhead in which two stainless steel link plates are worked. The topmast stay and topgallant stay, which would conventionally go down to the bowsprit and jibboom interfering with yard swing on the way, go instead to their respective link plates, which they do almost horizontally, passing between the foot of each sail and the yard below it. Equally the stays for staysail and jib, coming up from the bowsprit and jibboom, end at the link plates and are thus not present behind the yards. In the event of collision wiping out the jibboom and bowsprit, the Sky Link Assembly is capable of carrying the mast unaided. WEATHERLY BRIG MODEL: In 2007 a further sailing model was made, to scale 1:20, and incorporating these features, with a hull designed by the author to ensure weatherly ability in a Brig 41m long on deck, 7.4m beam, 4m draft and displacing 376 Tons. 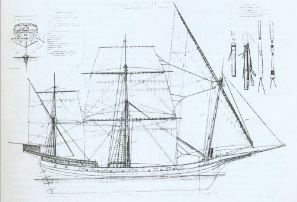 On sea trials its windward performance indicated that the full sized ship, encumbered with full standing and running rigging, deckhouses, boats, etc., might well exceed that of the less nimble fore-and-aft rigged ships. Thee photo shows her sailing practically straight into the wind. This model and two others on this page are now in the Museu de la Mar, Puerto Sóller, Mallorca (Spain).